The Hill House Home creator shares how to make the most of your bedroom. During business school, she started exploring her dream bedding for selfish reasons, but once she realized it had potential to be a sustainable business, she decided to go for it. And that’s how Hill House Home was born! We sat down with the entrepreneur and new mom (son Henry is 3 months!) who shared some brilliant tips to maximize sleep (we’ve adopted them already), debunked bedding myths, and admitted her totally embarrassing (and borderline creepy) guilty pleasure. 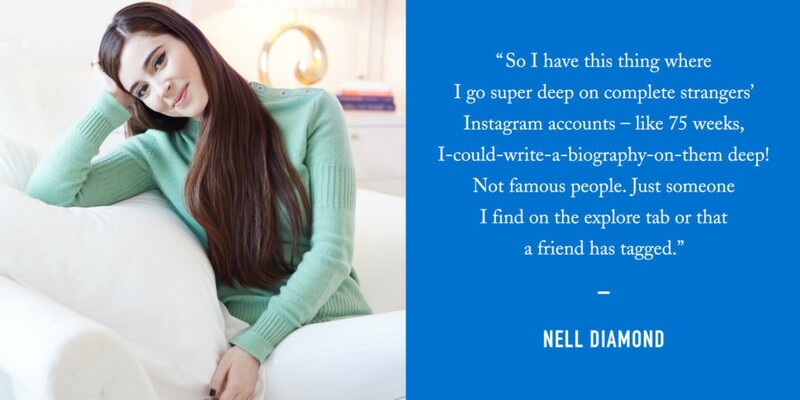 Meet the gorgeous, always overdressed, brutally honest, funny, and totally charming… Nell Diamond! Thread count is one thing to take into account — along with fiber, origin, and the actual machines being used in the manufacturing process — but it’s not the end-all be-all. And 1,000 thread count is not necessarily softer or better quality than 300. Also, there’s no regulation on thread count, so it’s more a marketing scheme than anything else. You want a long staple cotton fiber, which maxes out somewhere around 500 or 600 thread count, so be on alert if you see 1000 thread count. In terms of origin, supima cotton is woven in the U.S. and manufactured in Italy. It took us 2 years to find a fabric that looks and feels good, lasts a long time, and isn’t crazy expensive. Our fabric is beautiful and luxurious, but our designs are practical and functional — for example, we use elastic to keep your fitted sheet tucked in and envelope enclosures so your pillow isn’t constantly spilling out. I’m obsessed with monograms, which have been big for us. People can get their favorite song lyrics, a quote, or fun secret message embroidered. We are releasing mini symbols — think a four leaf clover, bee, playing card — embroidered in any color. It’s a fun way to personalize. Adults need a bedtime ritual as much as kids. It gets your body in the mode to sleep because as you are setting up for sleep, you begin to produce melatonin before you actually lie down. Things like a face-washing ritual, dimming the lights, and putting your phone away. What you sleep in matters. It should be different than any clothing you wear outside of the house. Your subconscious knows if you have on a tee shirt you typically wear to the gym. Sleep in an environment that makes you happy. You’re very receptive to what you see before you go to bed. You don’t want a cluttered nightstand to be the last thing you take in — that’s anxiety inducing! Sounds weird but set a bedtime alarm — your iPhone has one based on what time you want to wake up. Having a plan for going to sleep makes you accountable and conscious of the decisions you’re making and will push you into a mode where you’ll get better sleep. I launched Hill House Home last year, so I feel like I have 2 babies. Nurturing both is the hardest part. It’s hard going from one mode to the other. We were excited to get dressed up and go to a party and socialize recently, and then found ourselves in a corner for 15 minutes looking at photos and videos of Henry! There are a lot of different ways to be a parent, and you should go into every decision knowing that. You can be bombarded with opinions, but you have to figure out what is right for you and your baby. I’m a crazy researcher by nature, and I’ve found this is one thing where research doesn’t always give you the answer. Everyone says they don’t appreciate their parents until they become one. My mom moved 3 kids under the age of 6 to Tokyo — none of us speaking a word of Japanese. I can’t even imagine. When I was a freshman at Princeton, Daphne Oz was the coolest senior on campus. Hers was the first wedding and baby shower I ever went to. She has such a full life and I look up to her so much. I text her at 3am with questions, and she always responds and never makes me feel crazy. I love podcasts. My current favorites are How I Built This (entrepreneurs telling their stories) and Sword & Scale (super gory true crime stories). I’m so pale, so I wear Dennis Gross sunscreen all day every day. I also love his his hyaluronic moisturizer and Erno Laszlo hydrating masks — they makes you look crazy, but i really like them! The physical recovery is the most insane thing I’ve ever been through. And I’ve had to work really hard to lose the baby weight — there was no “falling off” for me. I’m following Daphne’s plan — no grains or sugar during the week, then eat what you want on weekends, which for me is all bagels all the time. I’m not even doing a little exercising. You have to give up something — and that’s the thing I’ve given up. So I have this thing where I go super deep on complete strangers’ Instagram accounts — like 75 weeks, I-could-write-a-biography-on-them deep. Not famous people. Just someone I find on the explore tab or that a friend has tagged. I find closet reorganization very fun! When I get dressed, I leave clothes everywhere, so I’m constantly picking up. And I love to read. My recent favorites are Grit, Shoe Dog, Hillbilly Elegy, and Before The Fall. Next up is When Breath Becomes Air. I’m obsessed with putting emojis (glasses, briefcase, etc) on him on Instagram Stories to turn him into a tiny businessman. I’ve created this whole weird series — he will die when he is 13! Originally published at news.rocketsofawesome.com on February 8, 2017.